Emmerson's strategy is focused on generating world class, copper-gold projects in stable jurisdictions. Also recognising that copper and gold are in demand and that many major mining companies no longer have inhouse exploration expertise. 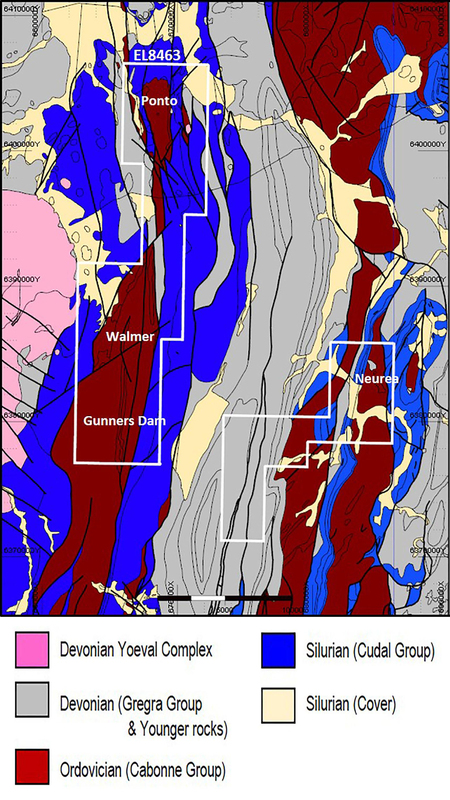 Emmerson identified the Macquarie Arc in NSW as a world class, metal endowed geological belt which for a variety of reasons, is well under represented in terms of actual deposits. 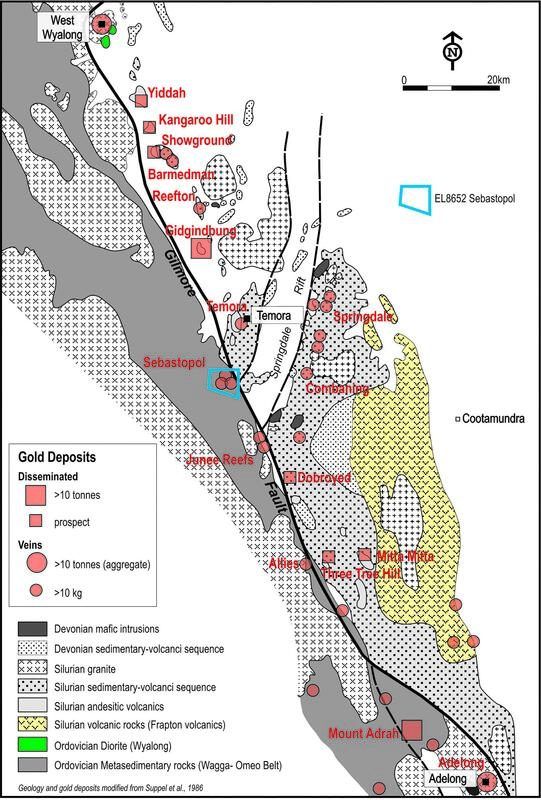 The metal endowment of the Macquarie Arc (in NSW) hosts >80Mozs gold and >13Mt copper with these resources heavily weighted to areas of outcrop or limited cover. Emmerson and our strategic alliance partner, Kenex Limited developed 2D and 3D predictive models from multiple datasets that aim to statistically improve the probability of discovery. In a "blind test" of this approach, the porphyry copper-gold models (for the Macquarie Arc region in NSW), identified 56moz of gold from the total known gold endowment (includes production) of 59mozs. Similarly, the epithermal gold model identified 6mozs from a total known endowment of 7mozs of gold. Emmerson's counter-cyclic entry into NSW in 2106 coincided with the downturn in the mineral industry, affording an opportunity to apply for large ground positions over prospective targets within the Macquarie Arc. 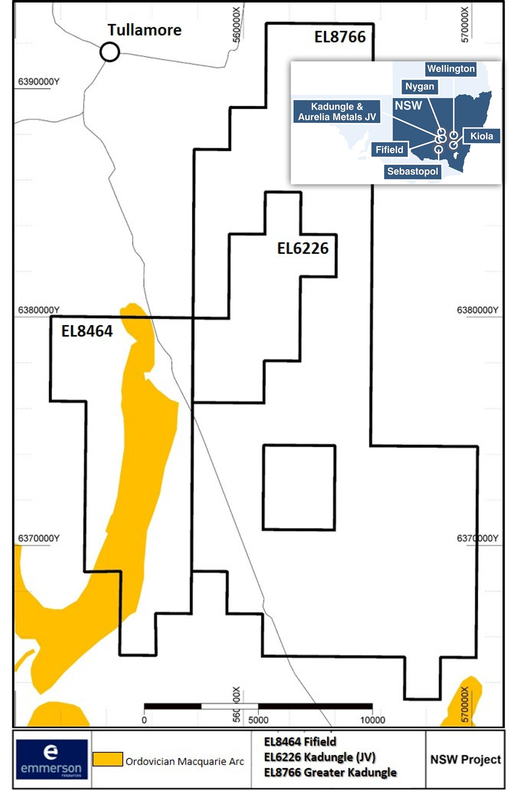 Emmerson's five exploration projects contain many attributes of the known deposits within the Macquarie Arc but remain under explored due to historical impediments, including overlying cover (farmlands and younger rocks) and a lack of exploration focus. 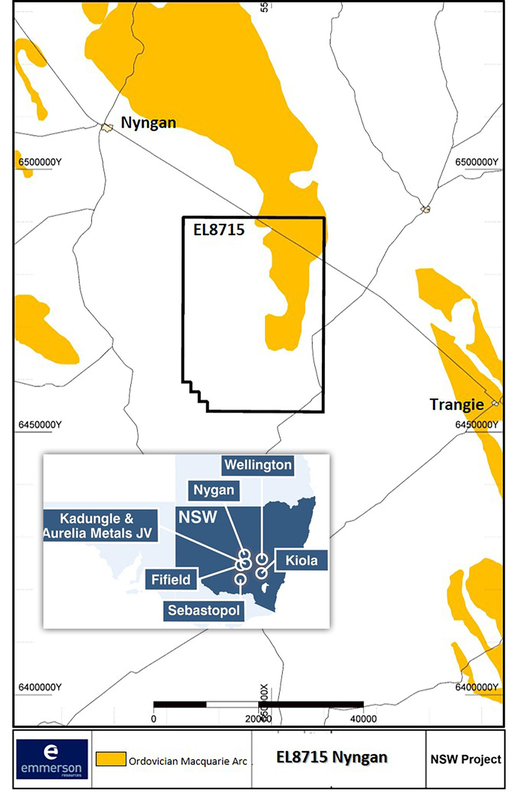 Kadungle is a JV with Aurelia Metals covering 43km² adjacent to Emmerson's Fifield project. The Lachlan Orogen is approximately 700 km wide and 1000 km long and has disputed complex evolutionary history. The Macquarie Arc is part of the eastern sub-province of the Lachlan Orogen (Fig. 1) and is the host to numerous porphyry Au–Cu deposits. It consists mainly of subduction-related Ordovician intermediate and mafic volcanic, volcaniclastic and associated intrusive rocks and was accreted to Gondwana in the Early Silurian, and underwent rifting and burial in the Middle to Late Silurian. It consists of four structural belts, namely, the western (Junee-Narromine), the central (Molong), the eastern (Rockley-Gulgong) Belt, and southern (Kiandra) volcanic belts (Fig. 1a). The evolution of these belts has been widely debated, but the most generally accepted scenario is that these were formed by rifting and dismemberment of a single arc, which developed along the boundary between the Australian and proto-Pacific plates during the Ordovician and was subsequently dismembered during the Silurian. An entirely intra-oceanic setting is postulated for the Macquarie Arc (Crawford et al., 2007), with four phases of arc-type magmatism, the earliest in the Early Ordovician, and culminating in the Late Ordovician to Early Silurian. Geochemical and paleontological data indicate that the Macquarie Arc evolved episodically over ~50 million years (Crawford et al., 2007). The four phases of volcanism in the Macquarie Arc relate to distinct groups of porphyritic intrusions that vary from monzodiorite-diorite through monzonite-granodiorite compositions and correspond with porphyry copper-gold and epithermal gold-silver mineralisation. Fig. 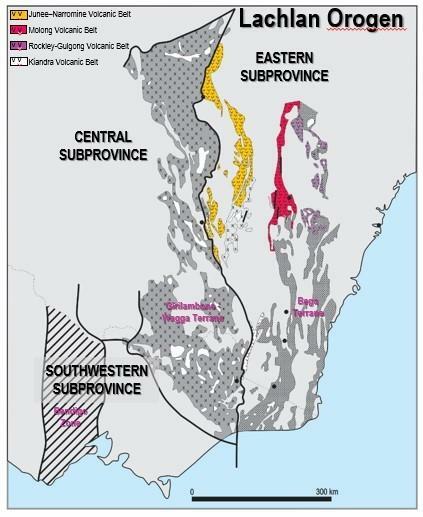 1a) Map showing the Lachlan Orogen sub-provinces and the four main Ordovician volcanic belts comprising the Macquarie Arc in the Eastern Subprovince. Fig. 1b) NSW regional magnetic map showing the location of Emmerson's projects in the Eastern Subprovince: EL8464 Fifield, EL6226 Kadungle, EL8766 Greater Kadungle, EL8715 Nyngan, EL8652 Sebastopol, EL8463 Wellington and EL8590 Kiola. EL8464 Fifield is located just south of Tullamore (Fig. 1) and approximately 50 NW of Northparkes Cu-Au mine. The terrain over the Ordovician arc is flat to gently undulation. EL8464 covers an area of 66.4 km². Fig. 1. Location of EL8646 Fifield Project adjacent to EL6226 Kadungle and EL8766 Greater Kadungle Projects. EL8464 lies within an inlier of Ordovician arc interpreted to have been rifted from the North Parkes Igneous Complex. The main Ordovician arc is dominated by the Raggatt Volcanics consisting of andesitic to trachy-andesitic lavas and volcaniclastic rocks. The Ordovician belt is 1-2 km wide and is flanked to the west by the Gobondery Granite, and to the east by Silurian basal conglomerate interbedded with sandstone and siltstone (Fig 2). Fig. 2a) Detailed aeromag of EL8464, also showing interpreted structures. 2b) Geology map of EL8464 Fifield showing mineral occurrences. First phase reconnaissance field work was completed in October 2017 and was aimed at verifying elements of our predictive targeting model. Follow up work in early 2018 included sampling, mapping, geochemistry and various geoscientific studies to assist in pinpointing the most prospective drill targets. It also included undertaking a structural interpretation from the recently flown aero magnetics. Geological mapping indicated the presence of several intrusions of monzonitic composition. Preliminary age dating yielded a late Ordovician to early Silurian age – undertaken as part of the University of Tasmania CODES ARC Linkage project. 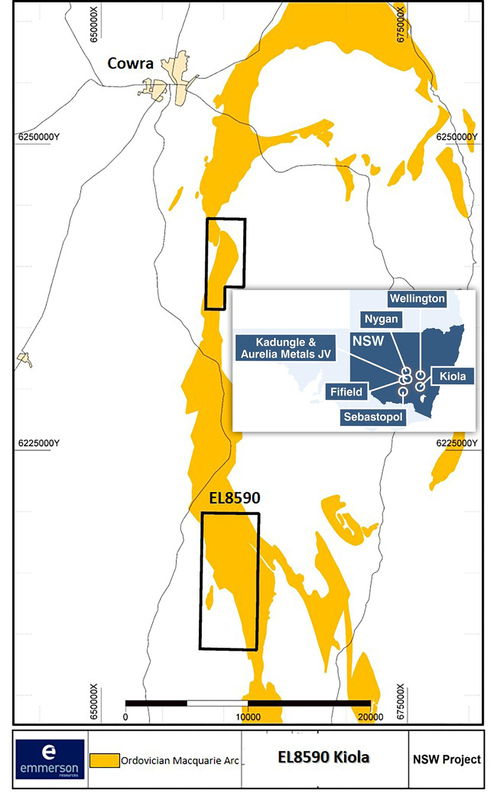 Following these very encouraging early stage results, and in recognition that these porphyry deposits typically occur in clusters, Emmerson has applied for additional ground to secure its tenure. 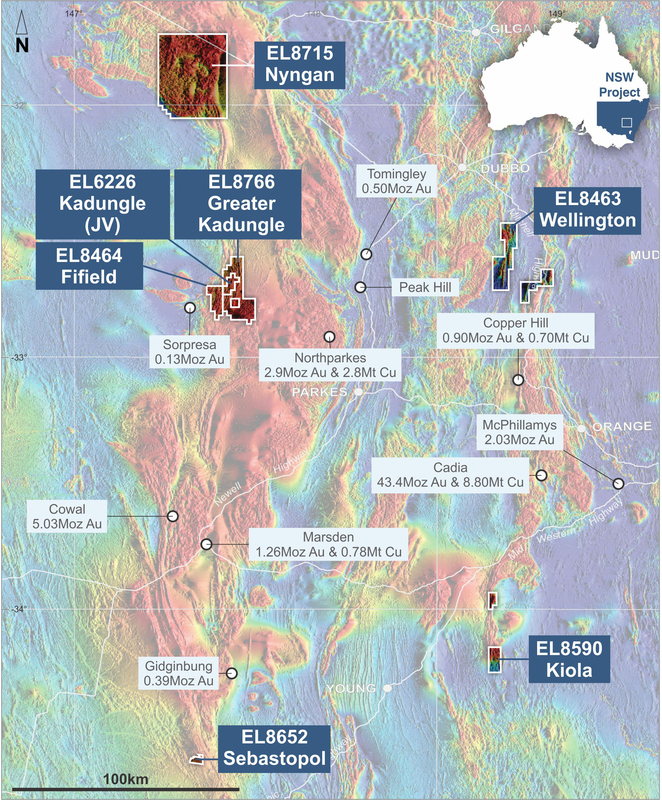 EL8463 is located in central New South Wales, approximately 15km west of Wellington (Fig 1). Access to the tenement are via a number secondary road from the Mitchell Highway which cuts across the tenement. EL8463 covers an area of 254.5 km². EL8463 is dominated by attenuated, folded and faulted remnants of Ordovician volcanic arc rocks surrounded by Silurian to Devonian sedimentary, volcanic and volcaniclastic rocks of the Cowra trough. These are partially covered by Devonian basinal sediments and intruded by granitoid batholiths of the Yeoval Suite (Fig. 2). The Oakdale Formation of the Cabonne Group, which forms part of the Molong Volcanic Belt consists of interbedded and andesitic to latitic lavas, tuff and breccia, volcaniclastic conglomerate, sandstone and siltstone, minor limestone, limestone conglomerate and breccia (Pogson et. al, 1998). The Ordovician Oakdale Formation crops out as a NS-trending bodies through the central and eastern section of EL8463 and is host to a number of small gold and copper occurrences in the area. Fig. 2a) Detailed aeromag of EL8463, also showing interpreted structures. 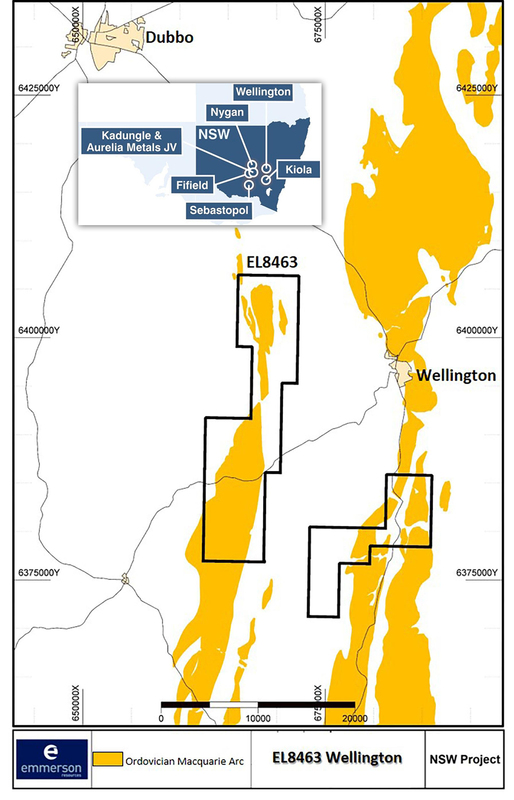 2b) Map showing generalized geology of EL8463 Wellington and location of mineral occurrences. First phase reconnaissance field work was completed in November 2017, aimed at verifying elements of our predictive targeting model. Follow up work in early 2018 included sampling, mapping, geochemistry and various geoscientific studies to assist in pinpointing the most prospective drill targets. It also included undertaking a structural interpretation from the recently flown aero magnetics (Figure 2). Geological mapping indicated the presence of several intrusions of monzonitic composition. Preliminary age dating yielded an Early Ordovician to Middle Ordovician age – undertaken as part of the University of Tasmania CODES ARC Linkage project. Auger soil sampling in March 2018 across the Ponto prospect (the northern most area) has revealed moderate copper anomalism, corresponding to outcrops/float of copper altered intrusions. The most coherent geochemical result came from Ponto East (Figure 4), with a 500m² area of +200ppm copper and combined gold-copper-molybdenum anomalism. EL8590 is located between the townships of Cowra and Boorowa, in central NSW (Fig. 1). It occupies a portion of the Ordovician Molong Volcanic Belt, which also hosts Newcrest’s Cadia-Ridgeway Cu-Au porphyry deposit and covers an area of 71.2 km². EL8590 occurs beneath the Benambran unconformity and within 5km-10km of the Lyndhurst-Neville Fault (locally termed the Frogmore Fault zone). Where the Bega terrane is juxtaposed against the Macquarie Arc. The dominant host rocks belong to the late Ordovician Kenyu Formation and comprise volcaniclastic sediments, andesites/basalts and lesser felsic pyroclastics (low- medium K) with minor black shale and limestone. 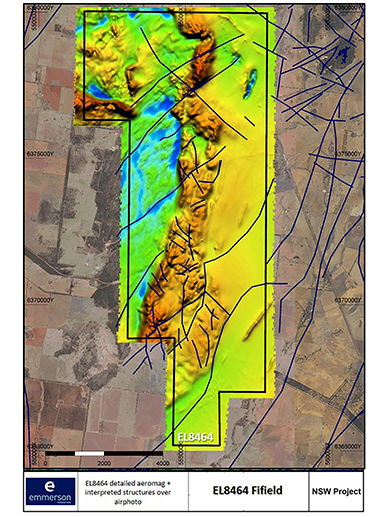 The Kenyu Fm is bounded to the west by the Silurian Hawkins volcanics (rhyolite, rhyodacite and ignimbrites with volcaniclastic sediments and minor limestone) of the Cowra Trough. Bounded to the east by granites of the Silurian Hovells Suite (Wyangala and Licking Gully Granites), which in turn are intruded by the Devonian Boggy Plains (Wyoming) Granite and Cainozoic basalt (Fig.2). The Frogmore Fault Zone, a key controlling structure, has a long history of intense faulting, folding and thrusting, having formed during the Benambran orogeny and then reactivated during the Tabberabberan and Kanimblan deformational events (Thomas & Pogson 2012). 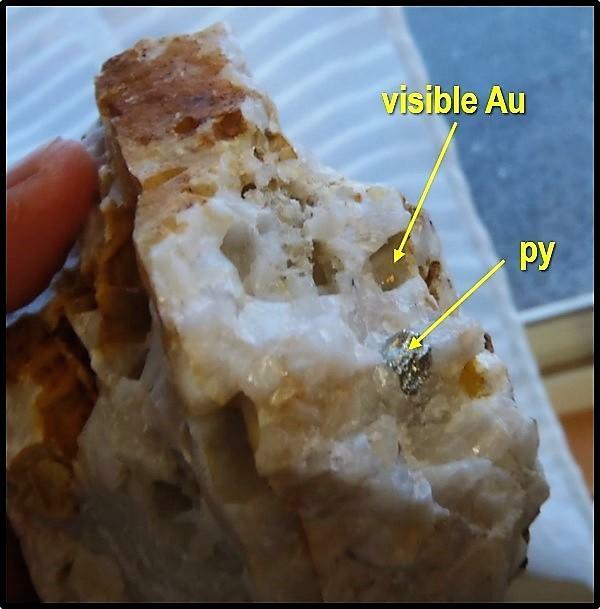 Historic exploration has been for vein hosted gold, skarn and porphyry copper-gold. Fig. 2. 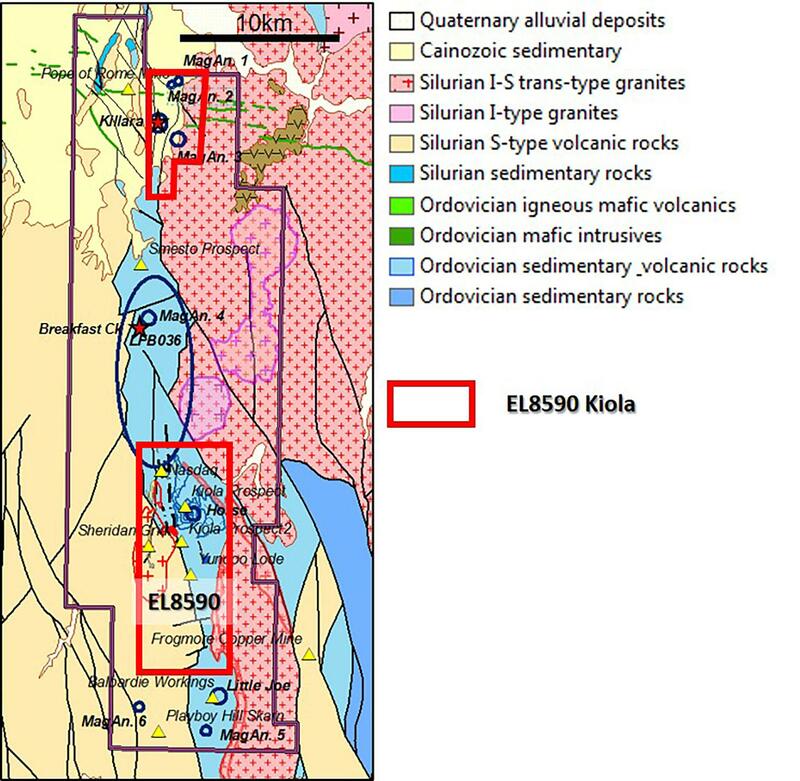 Map showing generalized geology of EL8590 Kiola and location of mineral occurrences. First phase reconnaissance field work was completed in April 2018, aimed at verifying elements of our predictive targeting model. This work included sampling, mapping, and various geoscientific studies to assist in pinpointing the most prospective drill targets. It also included the reprocessing of historical geophysics and structural interpretation of the data. Recent results from Kiola came back with up to 19.6% Cu and 0.36 g/t Au has been reported from rockchips. Whilst the elevated copper is associated with surficial malachite veins, the entire 28km² “Kiola Geochemical Zone” is anomalous in copper. Field based exploration has been complemented by cutting edge science which has included analysis of the alteration (trace and rare earth elements within the outer green rock or epidote/chlorite zone) where initial findings suggests geochemical footprints of a porphyry system. Moreover, age dating of the intrusions inside the “Kiola Geochemical Zone” yielded a Late Ordovician – all part of the University of Tasmania CODES ARC Linkage project. 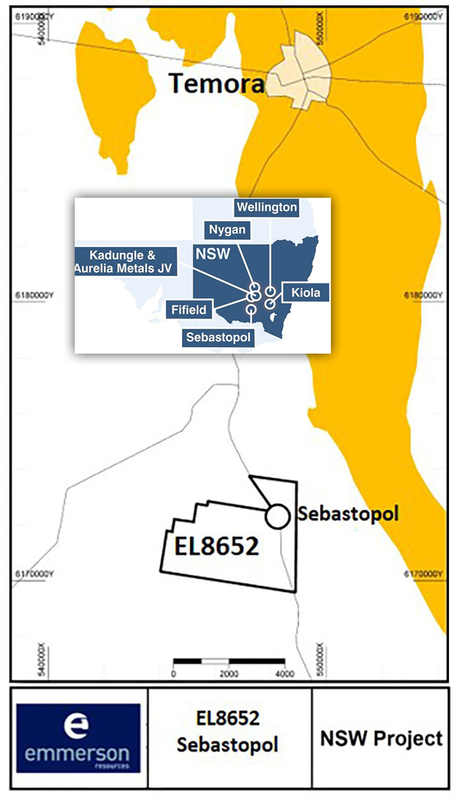 EL8652 Sebastopol is located ~5km southwest of Temora and extends approximately 20km south including the town of Sebastopol in central New South Wales (Fig. 1). EL8652 covers an area of 13.5 km². 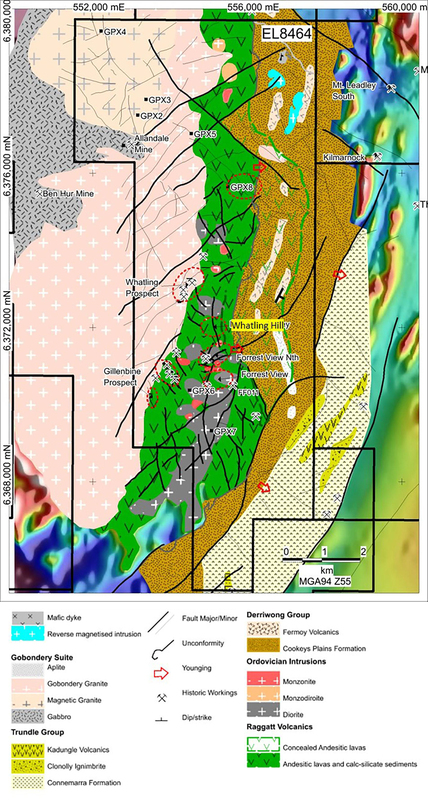 EL8652 Sebastopol covers a portion of a ~30km strike length of the NNW-trending Gilmore Fault Zone(GFZ), a crustal-scale, historically active structure, that has been recognized as being a significant regional control on gold mineralization in the area (Fig. 2). EL8652The GFZ separates outcropping belts comprised of Late Ordovician metasedimetary rocks (Wagga Group) and the S-type granites in the west from the complex sedimentary and volcanic Ordovician to Devonian sequence intruded by I- and A-type granites to the east (Fig. 2). EL8465Several historic gold mines are present within EL8652 covering the Sebastopol Gold Field. Several historic gold mines are present in the tenement, these include the Morning Star, Evening Star, and Homeward Bound mines. These mines have a north-westerly trend which parallels the orientation of the GFZ. A second, subordinate, parallel mineralised trend is defined by the workings at Barron Syndicate, Chow Chow Mine and Maid of Judah. Gold was first discovered in 1869 at Sebastopol, where the gold-bearing quartz veins can be traced intermittently for ~3km). Enriched gold ore shoots from historical underground workings ranges from 11 g/t Au to 248 g/t Au. The deepest workings are at 357ft (109m) level, where primary sulphide ore still occur. The mineralization at Sebastopol appears to be typical of shear-hosted gold veins formed under mesothermal conditions and categorized as orogenic and structurally controlled. Generalized geological map of the West-Wyalong-Temora-Adelong District, also showing the spatial distribution of gold deposits and occurrences close to the Gilmore Fault. Emmerson Resources tenements EL8452 Sebastopol is also shown. First phase reconnaissance field work was completed in October 2017, aimed at verifying elements of our predictive targeting model. 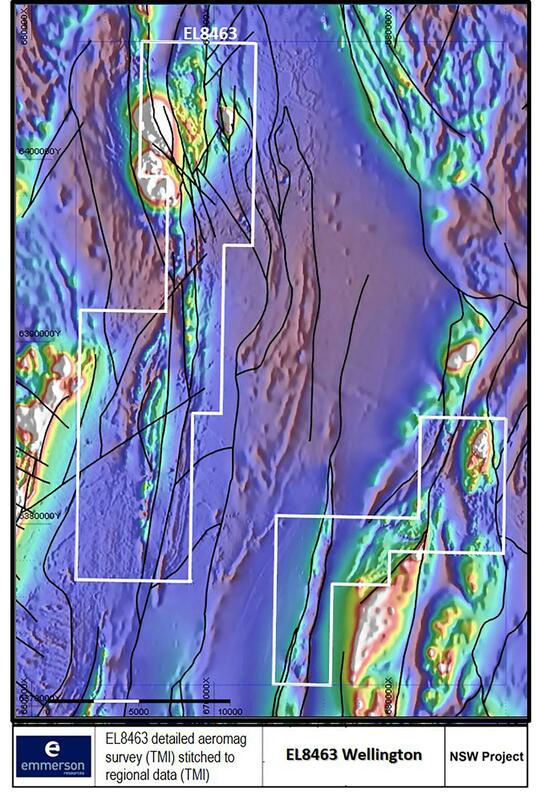 This work included sampling, mapping, and various geoscientific studies to assist in pinpointing the most prospective drill targets. Results from field base activities at Sebastopol yielded significant result which include up to 27.8 g/t gold from rock chip samples (Fig. 3). In EL8562, Ordovician metasedimentary rocks and Ordovician to Silurian(?) andesitic volcanic rocks, similar to the Gidgindbung host sequence, are juxtaposed along the Gilmore Fault (with visible gold, Fig. 3) within the Morning Star project. This cluster of historic workings is associated with a series of sub parallel quartz veins that contain gold, galena, chalcopyrite and pyrite hosted by the Wagga group turbidites. Fig. 3 Massive quartz, vuggy, cubic pyrite crystal, visible gold noted inside the vug, sample from a shallow pit, near Barron Syndicate Mine. EL8715 22km south east of Nyngan, 19km west of Warren, 35km north west of Narromine and 22km north north-east of Tottenham, in central NSW. EL8715 covers an area of 974 km². The Nyngan project is considered to be prospective for porphyry copper gold mineralisation. Located beneath approximately 220 m thickness of Mesozoic-Quaternary cover is a Palaeozoic basement of presumed Macquarie Arc volcanics and intrusions of the Nyngan Intrusive Complex. Work done on the tenement commenced in August 2018 which included core review of historical holes and preliminary review of open file data. Detailed assessment of prospective targets will continue and will be ranked to identify the highest priority targets. Detailed aeromag survey will also be considered over defined areas. First phase reconnaissance field work is scheduled in 2019.